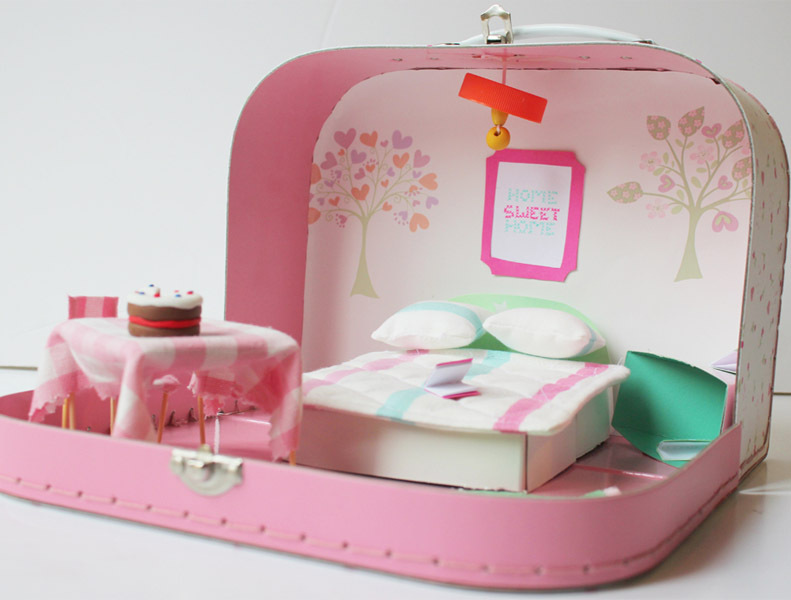 This doll house is great for play on the go. 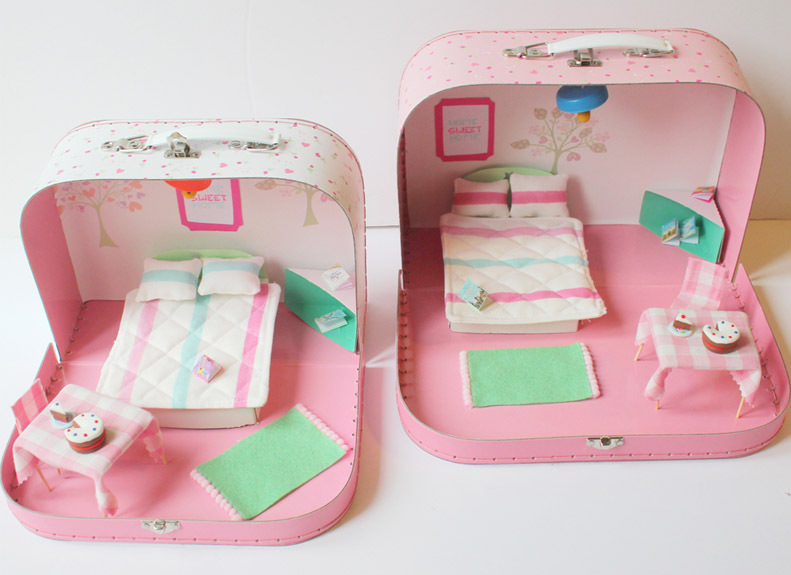 We’ve turned these lovely Amelia floral suitcases into a couple of cute pads, perfect for a little teddy or doll. 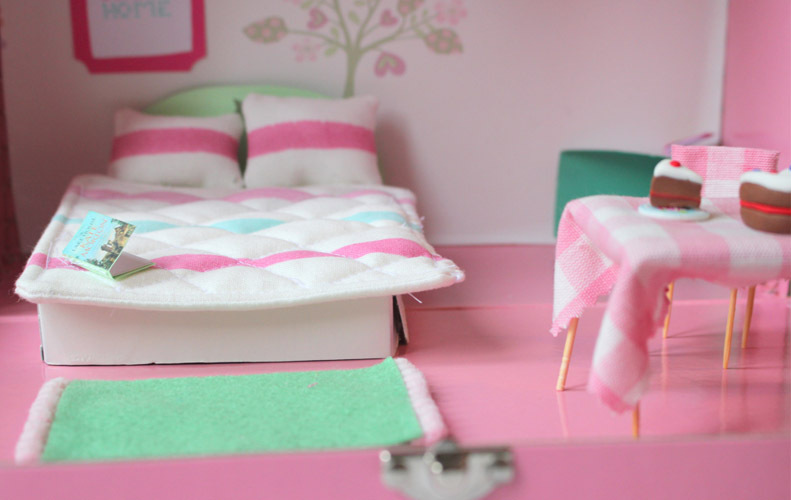 The portable houses are complete with a bed, table, chair and a few simple accessories. We’ve used scraps of Painterly Stripe Pink Fabric and the Gingham Check Pink Fabric, as well as a little Esme wallpaper to line the walls. 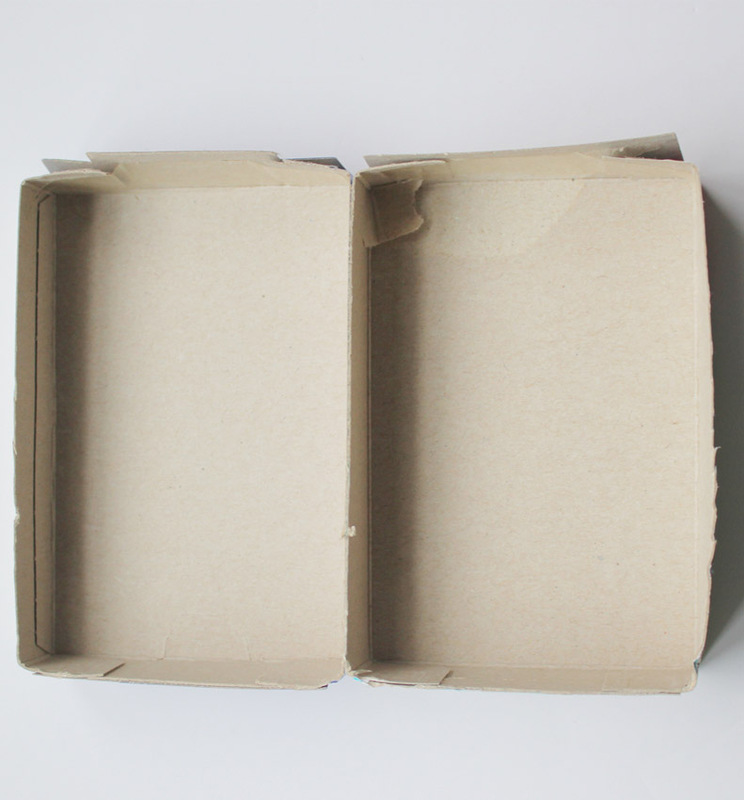 To create the bed, cut the cardboard box in half along the narrow sides and glue these together longways. Paint white. This may take several coats for even coverage. To make the headboard, cut a rectangle of green card stock the same width as the end of your bed and add curved edges to the tops. 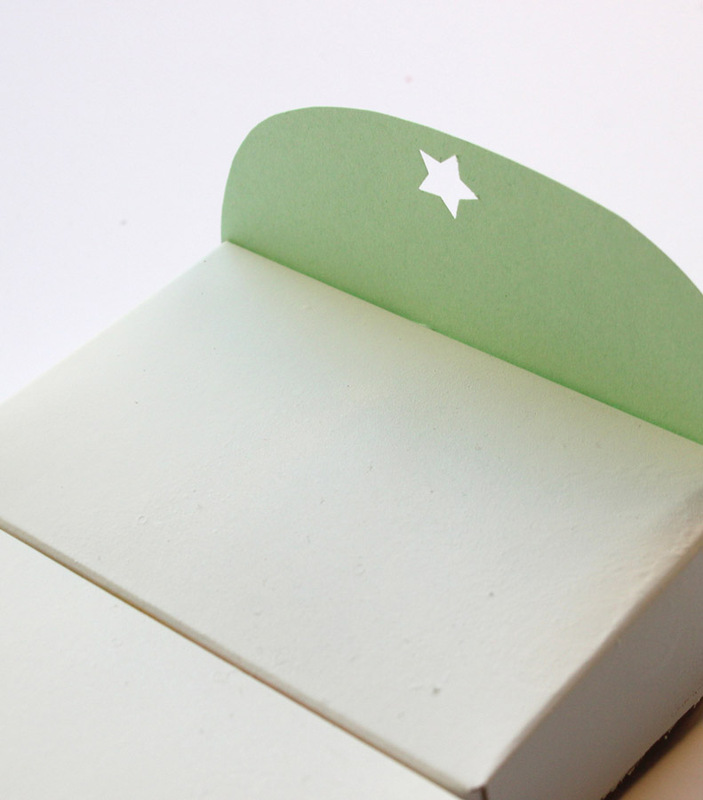 Then use a star shaped hole punch to add a design. Glue onto one end of the bed. For the quilt, cut two 6″ squares from the pink Painterly Stripe fabric and cut wadding the same size. Place the fabric (right sides together) on top of the wadding and pin all three pieces. 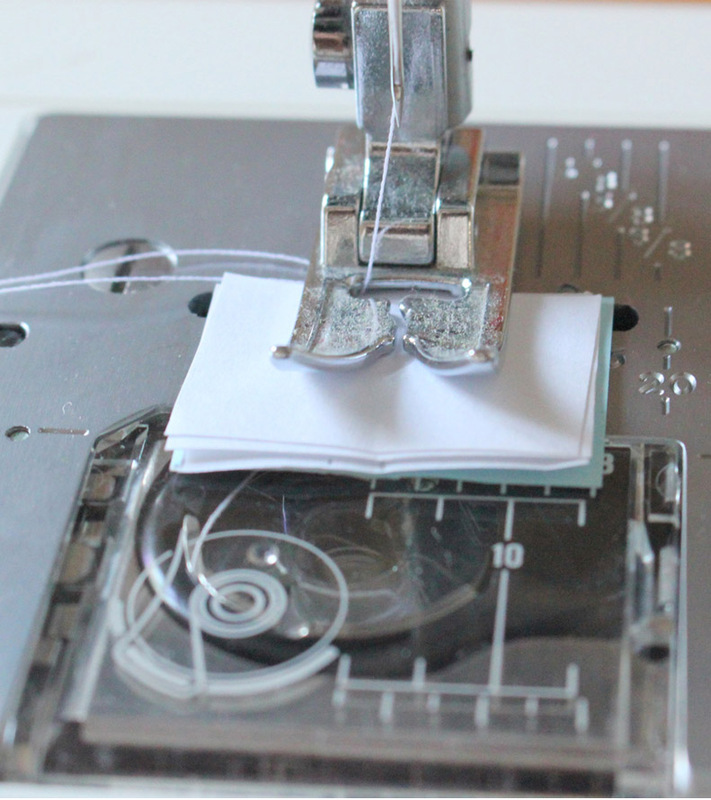 Sew around all four sides with a 0.39″ seam allowance. Leave a 2″ gap on the final side for turning. Trim off the corners of the fabric and wadding and turn right side out so the wadding is in the middle. Hand sew the opening shut. 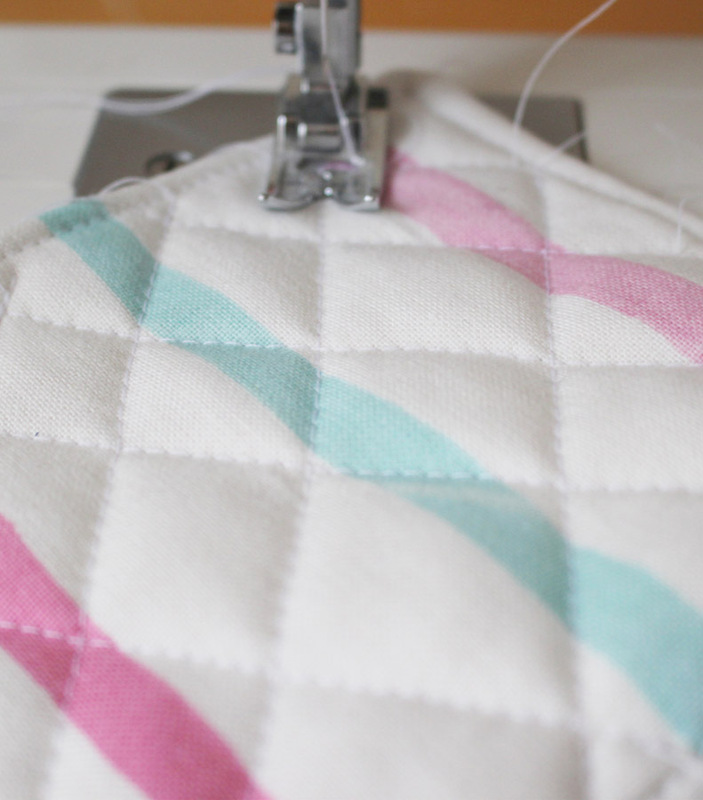 Then use a sewing machine to stitch a border and diagonal lines onto the quilt. 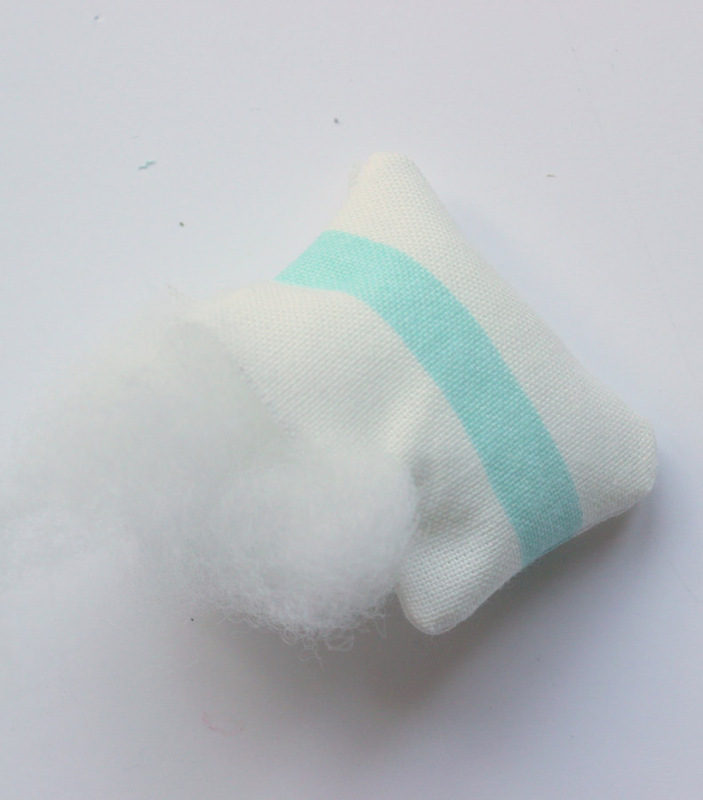 To make two pillows, cut four pieces of the Painterly Stripe pink fabric measuring 2″ x 2.5″. Pin two of the pieces of fabric right sides together and sew three of the sides together. Turn the pillow out and stuff with a small amount of toy stuffing so its nice and plump. Hand sew the remaining side. To make the books, we used pictures of books we found in a magazine. Cut out and glue each picture onto a piece of the card stock. Cut the picture out adding space (the same size as the picture) to the left for the back cover. Fold to make the spine. Then open the book and draw around it onto white paper. Cut three or four of these out to form the pages. You can fold the paper and cut all at once for even sizes. Place the paper on top of each other inside the cover. 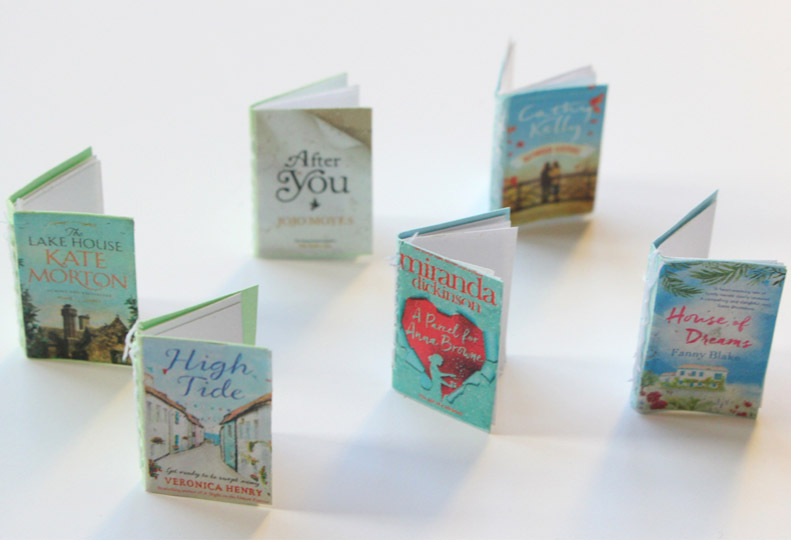 Use a sewing machine to sew down the spine and fold the book to close it. For the cake, take two small balls of brown modelling clay (about the size of a blueberry) and squash them so they’re about 1/4″ thick. Roll out a thin piece of red clay, place the brown piece on top and cut around it. Sandwich the 3 pieces together, then add another thin circle of white on top for the icing. Add red cherries and blue blueberries. If you prefer, you can slice a piece of the cake out before baking it. 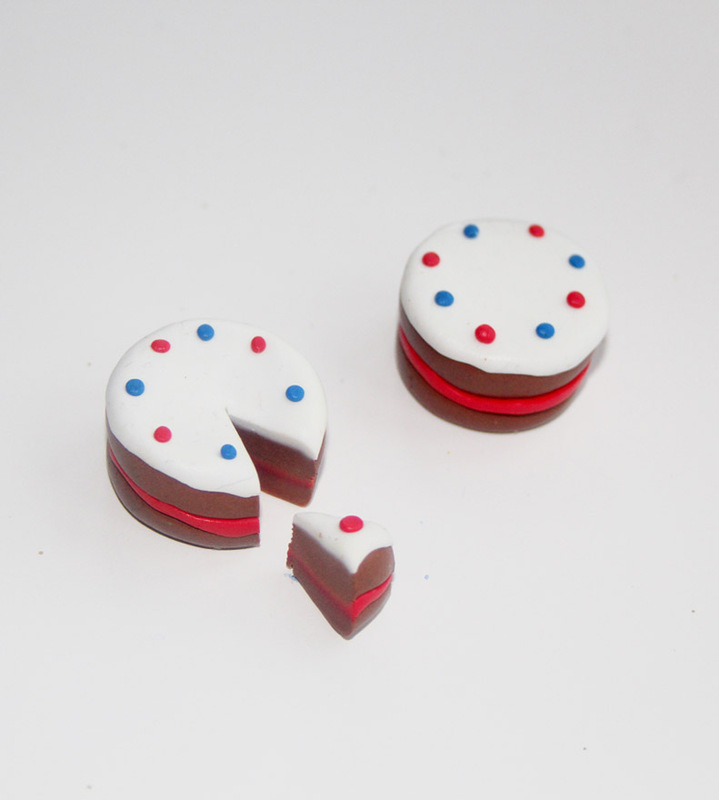 Then, once cooked, glue the slice onto a little button to look like a plate. 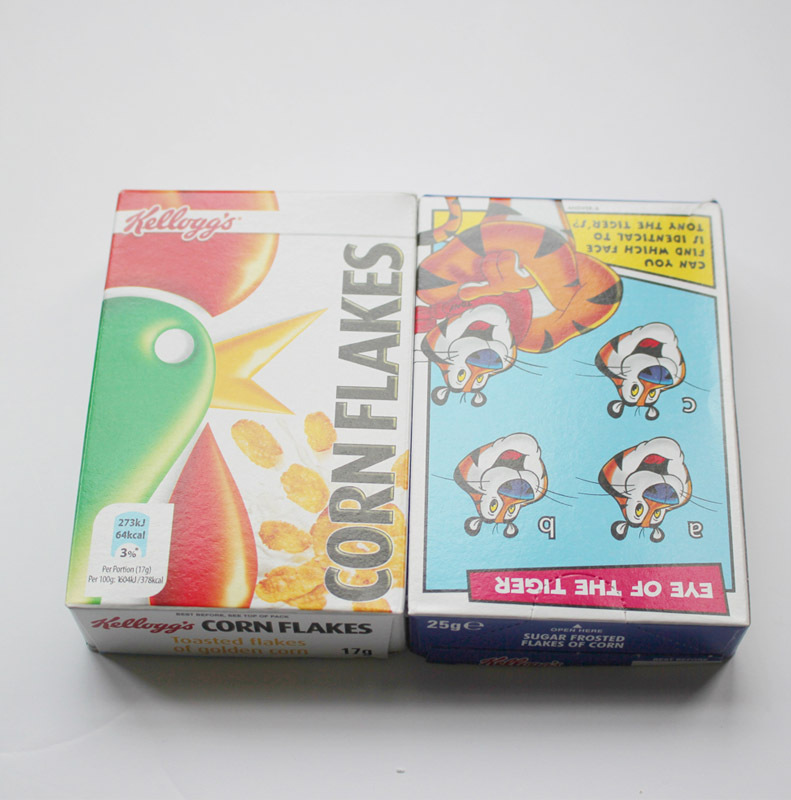 For the table, cut a 4″ x 3″ piece of corrugated card stock and pierce each corner using a pin and blue tack. Insert the cocktail sticks into the holes and cut the tops off at the height you want your table to be. Glue in place to secure. 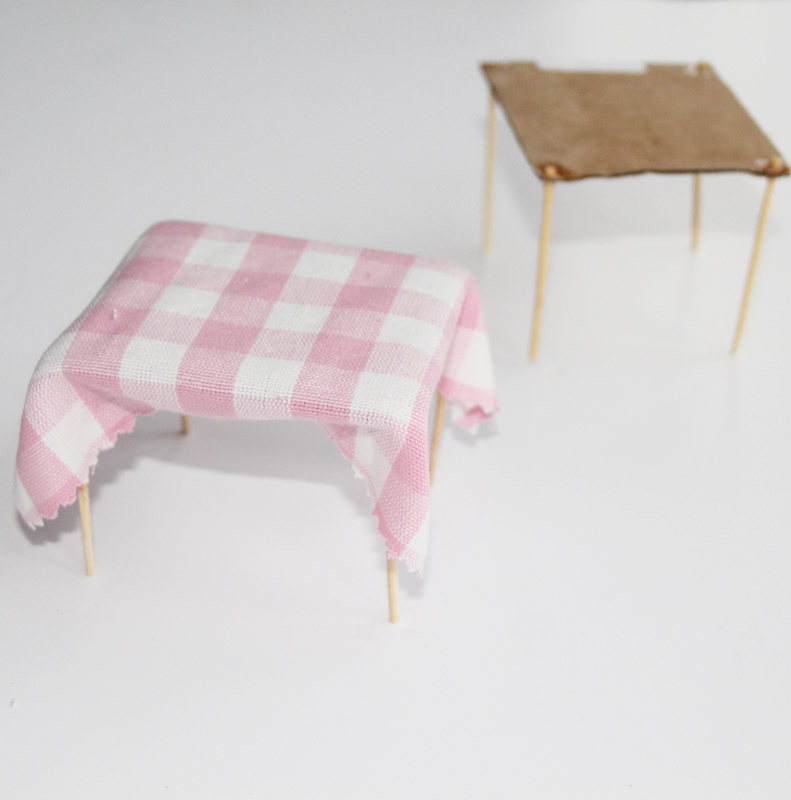 Cut a 6″ x 5″ piece of Gingham Check Cotton Fabric and place it on the table. Pinch the fabric around the legs, then glue in place. 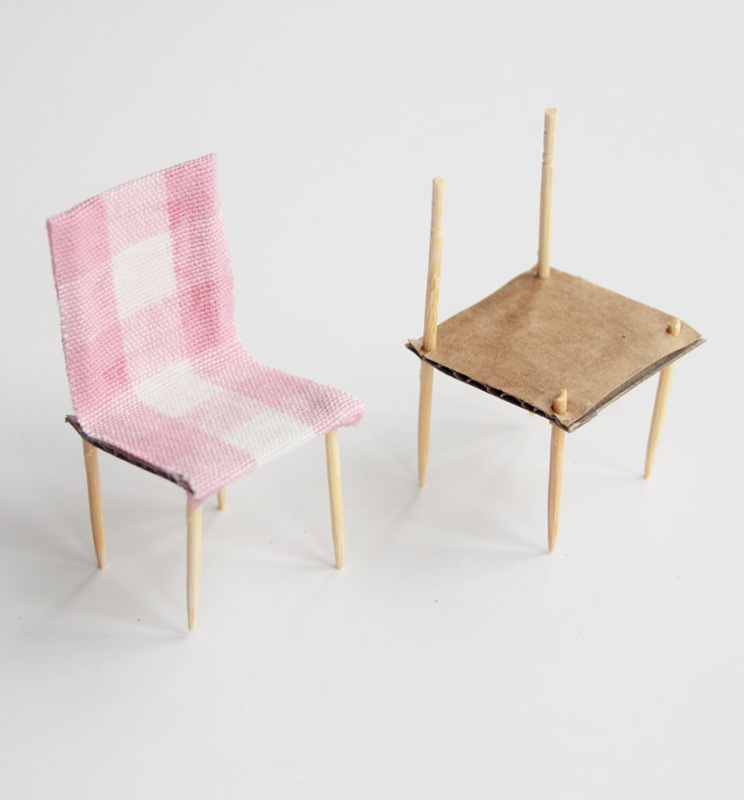 For the chair, cut a 1.5″ square of corrugated card stock. For the back of the chair and legs, insert two cocktail sticks into the square as you did for the table, but slide the cardboard to the centre of the sticks. Cut another cocktail stick in half for the front legs and insert these into the card stock. Glue them all in place. Cut a strip of the gingham fabric (about 1.5″ x 4.5″), glue over the back of the fabric, then cover the top and back of the chair. 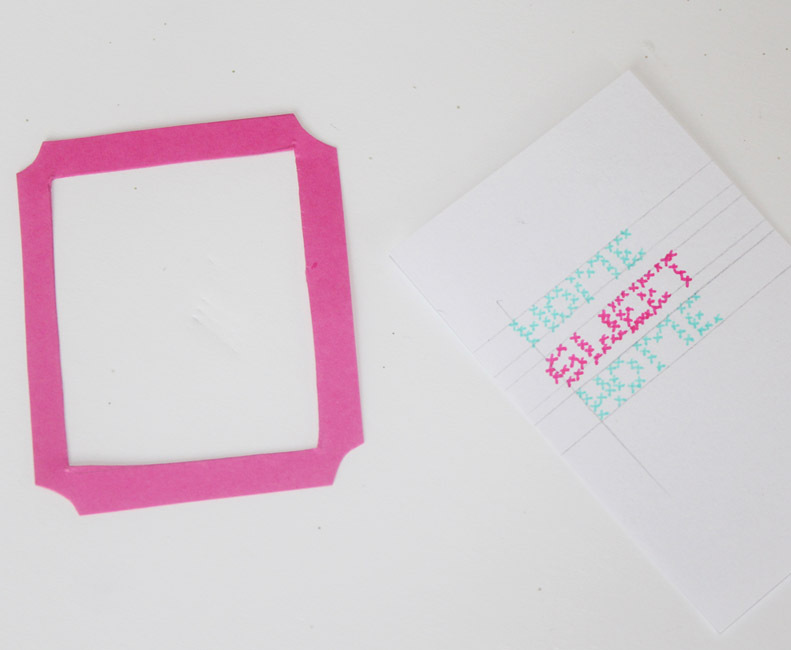 For the framed art, cut a little decorative frame from pink card stock and draw around it on white paper. Then you can create whatever you like on the white paper, cut it out and glue it onto the frame. We did a cross-stitch message using fine lined coloured pens. 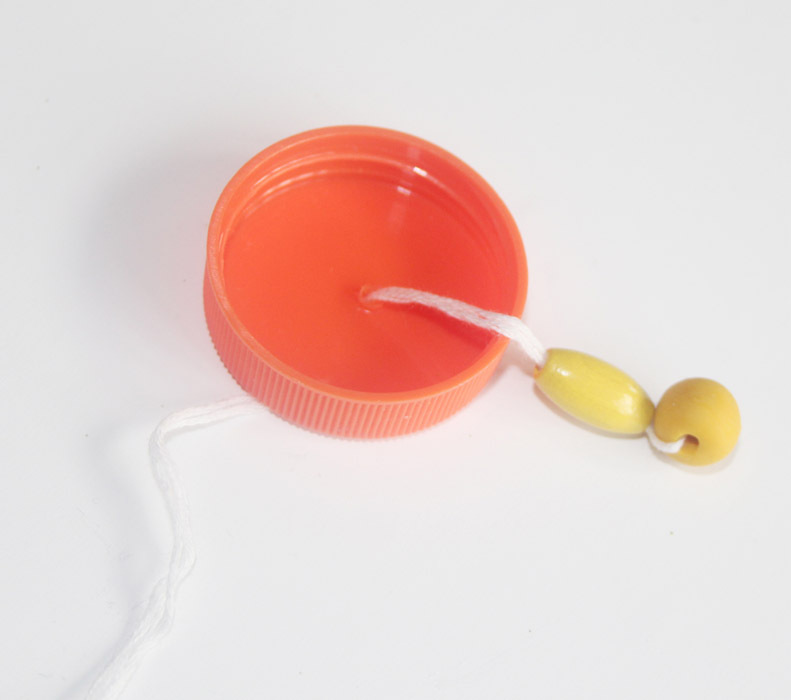 Finally, to make a small lampshade take a bottle top and pierce it using sharp scissors. Thread the beads onto a string then feed it through the hole and tape to the top of the house. We also made shelves from card corners that came attached to a new photo frame. 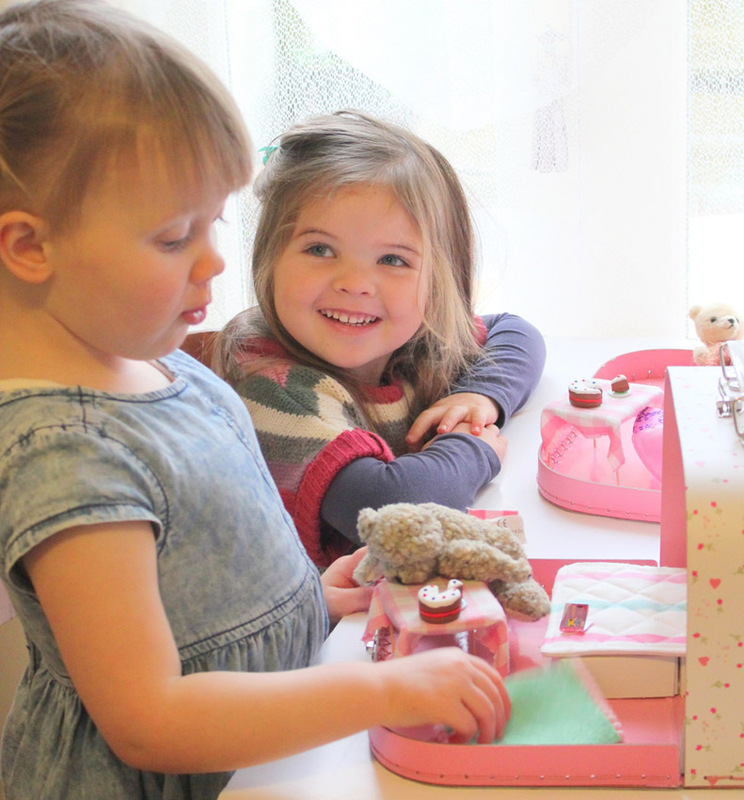 Fill the doll house with your child’s favourite toys for hours of fun and amusement! 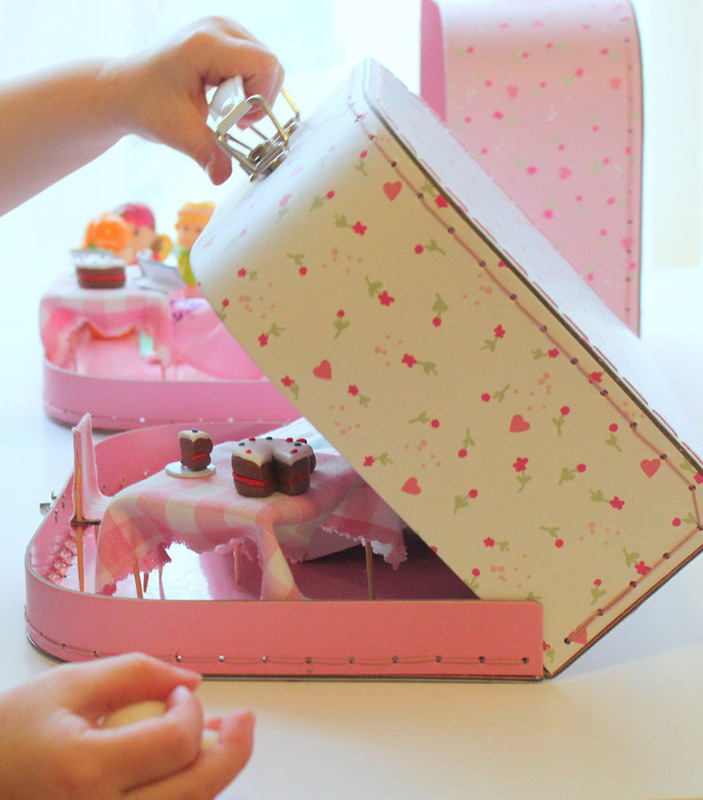 For more baking, crafting and sewing tutorials, hop over to Little Button Diaries. 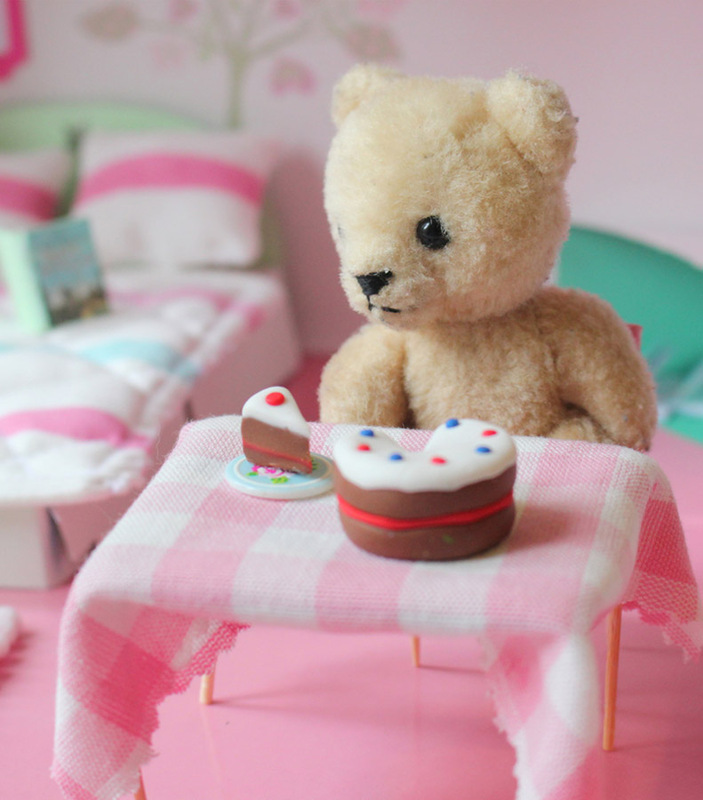 A big thank you to Laura and Tia from Little Button Diaries for their adorable Make & Do! 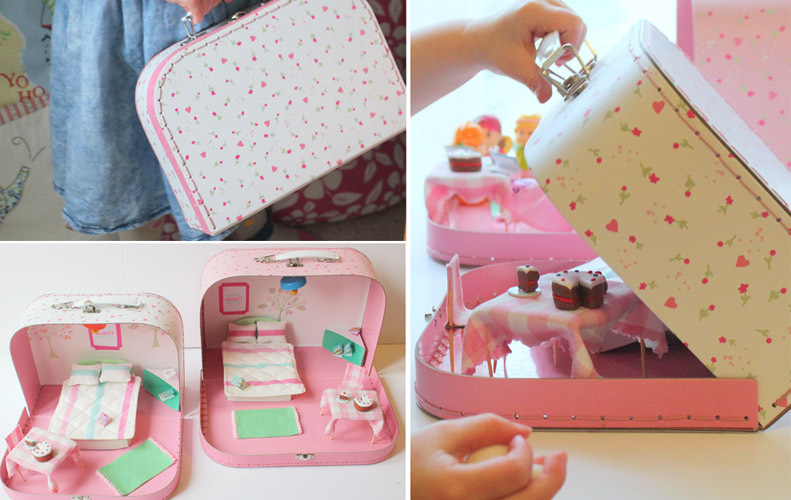 Are you inspired to make a suitcase doll house, too? Let us know below or show us your pictures on Instagram @LauraAshleyUSA – we love seeing your crafts! This entry was posted in Make & Do and tagged amelia floral suitcases, baking, crafting, doll house, dolls, dolls house, esme wallpaper, gingham check pink fabric, girls doll house, Little Button Diaries, Make & Do: Suitcase Doll House, make and do, painterly stripe pink fabric, pink, sewing. Bookmark the permalink.